1. During an emergency, the more people are around, the less likely the bystanders will help. The speed of help will also be reduced. In other words, if you’re in an emergency situation, you would hope that fewer people are around so that you will get help faster. 2. During an emergency, bystanders tend to look at the reaction of others before they decide to do anything. So if all bystanders do not look like they’re worried about the situation, you’ll probably be less worried and probably be less likely to take action. 3. Some researchers suggest a model of helping called Limited altruism: 1) the probable cost to bystanders for attempting to help & 2) the victimâ€™s state of need. Meaning we all weigh the cost to us and the need of the victim before we decide to take action. Here’s an activity I did with the other students. I gave them 9 situations and asked them to decide whether they would help or not help or undecided. You could try this out and my classmates’ decisions are in italics. Youâ€™re walking in a park on a cold Sunday evening. You come across a young crying child. The child had dropped a toy that is floating in a pond out of the childâ€™s reach. The pond is about knee-deep. There are several bystanders in the area but none of them seems to be the little childâ€™s parents. Would you wade into the pond to retrieve the toy? Youâ€™re walking in a park on a cold Sunday evening. You come across a young crying child who had fallen into a pond. The child is floundering out of armâ€™s reach. The pond is about knee-deep. There are several bystanders in the area but none of them seems to be the little childâ€™s parents. Would you wade into the pond to save the boy? You just drove into a parking lot at the local mall. There are many shoppers and cars around. A college-aged girl approaches you. She tells you that her car broke down and sheâ€™s expecting an important long-distance call from the admissions board of the law school that she wants to go. Her home is 7 miles away. Would you help her by driving her back to her home? You are leaving the mall. There are still many shoppers and cars around. A college-aged boy approaches you. He tells you that his car broke down and he has an appointment with his doctor for his annual check-up today. The doctorâ€™s office is 7 miles away. Would you help him by driving him to the doctorâ€™s clinic? You are driving on your way up to Iacocca. You are in a hurry to get to class; itâ€™s your turn to present in the Doctoral Seminar. You see a car by the road side. A man is sort of slumped over the steering wheel. You are driving on your way up to Iacocca. You are in a hurry to get to class; itâ€™s your turn to present in the Doctoral Seminar. You see a car by the road side. A man is sort of slumped over the steering wheel. You see there are many cars ahead of and behind you. Would you call campus police to check on the man? You are in a local high school classroom collecting data for your research/work. You see a teacher roughly pushing a student against a wall. The student doesnâ€™t seem to look distressed. Both teacher and student look as if theyâ€™ve gone through this before. But the rough handling of the student continues on. Today’s doctoral seminar is on the study done by Zimbardo and colleagues in 1973. Interpersonal Dynamics in a Simulated Prison. The researchers placed 20 normal male college students in a simulated prison in the basement of the Dept of Psychology at Stanford. Nine of them were to role play as prisoners and the other 11 as guards. And within 2 days, the prisoners suffered acute emotional disturbance, and the guards became aggressive and dehumanizing. The conclusion is that the prison environment is so pathological that even normal people would start behaving crazy once they are inprisoned. Originally the researchers planned to run the experiment for 2 weeks but they had to end the experiment after 6 days because the behavior change in both prisoners and guards were so extreme. It was no longer ethical to retain the prisoners in this state of oppression. The students were paid $15 a day to participate in this study. I wonder how much the $15 is worth now in 2005? I’ve just booked my ticket back to Malaysia. 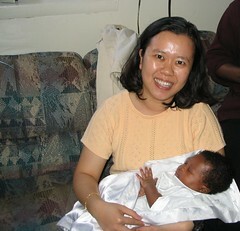 I’m going home on Dec 14, 2005 and returning to the US on Jan 12, 2006. I’m flying off from NY JFK airport to Incheon, Seoul and then hang out at the airport for 5 hours and then continue to KLIA. Looking forward to “visiting” South Korea. And especially looking forward to the warm weather and good food back home. Last Friday I hosted a small “thank you” housewarming dinner for a few of my friends who helped me move to my current apartment. 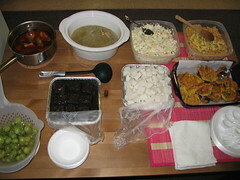 Top left (clockwise): asam pedas chicken, chicken kurma, potato salad, tomyam fried rice, korean omelette, ketupat, brownies, and grapes. 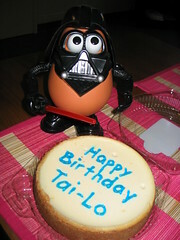 Have a Wonderful Birthday, Tai-Lo! I had the Bystander Effect presentation today. And I have a midterm exam tomorrow. Right now I think I’ve burned up all my fuel for the day: cannot focus on reading about phonemic and decoding instruction. So I spent the time uploading pictures and updating this blog. My first picture taken with Henry Jr. It was also the first time I carried him. I can’t help but laugh at this picture. I’m the fairest of all. 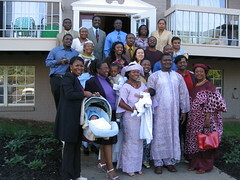 Henry Jr’s baby baptism. Henry Sr and Mary are close friends of mine from the Bible study that I attend. They came to help me move to my new apartment even though it was really close to the baby’s due date then. And on the day the baby was born, I had to borrow Henry’s car to go pick up the mattress set that I bought from Sleepys Direct. Who would have thought? I came all the way to the US from Malaysia and I end up being immersed constantly in African culture. 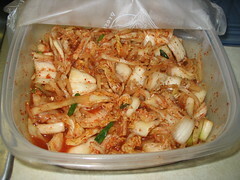 My latest attempt at making kimchi. So far all the kimchis that I’ve made have turned out not as good as I would like them to be. Including this one. Somehow they lacked the BOH Uuuummpphhh. A special picture for Amanda. 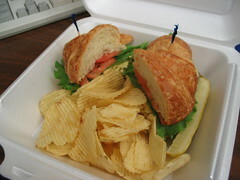 Today’s sandwich of the day is Curried Chicken Salad on a Croissant.